The Provincial Eating Disorders Awareness (PEDAW) campaign is launched every year from February 1-7 with activities and events taking place throughout the year. It is a province-wide effort, brought to you by Jessie’s Legacy Eating Disorders Prevention & Awareness, a program of Family Services of the North Shore, to raise awareness around prevention and early intervention of eating disorders as well as media literacy, resiliency, building healthy body image and self-esteem. We hope you can take an active role to support the launch of this movement and start some meaningful and engaging discussions, as well as activities at your school, with your family or at your workplace. This documentary exposes how multi-million dollar industries saturate our lives with images of unattainable beauty, fueling insecurity and body hatred. The Illusionists turns the mirror on media, exposing the absurd, sometimes humorous, and shocking images that seek to enslave women, men and children. The film will be followed by a discussion and Q&A with leading experts including Illusionists’ Italian Filmmaker, Elena Rossini. 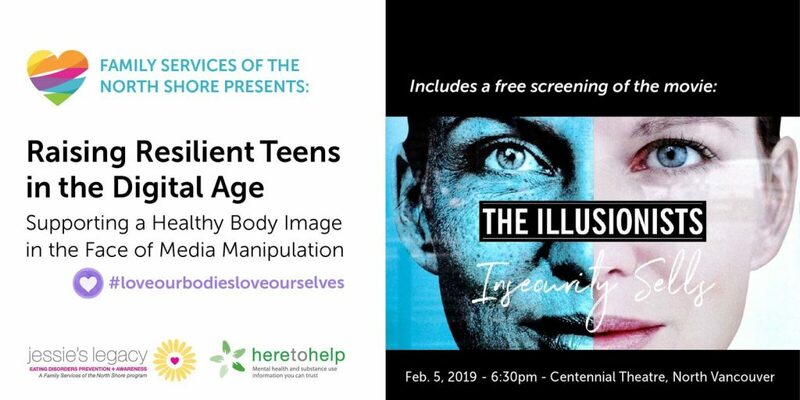 The discussion will focus on how to raise resilient teens, create thoughtful media consumers, and support a healthy body image in the face of media manipulation. 2. 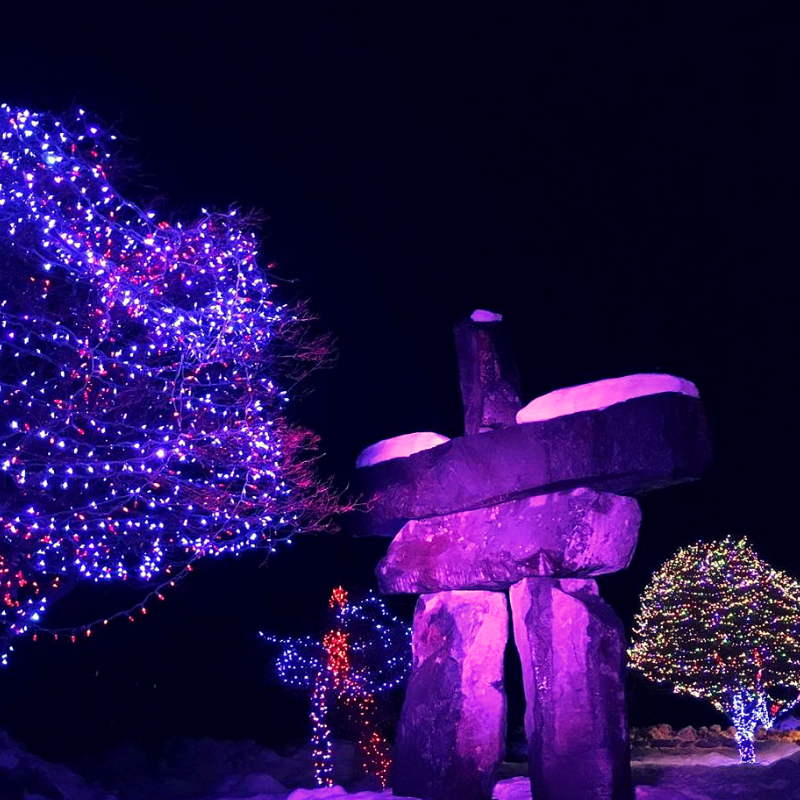 Snap a photo of yourself or a landmark that is lit purple. Get creative! We will share your social media posts all week long! Don’t have a wristband? 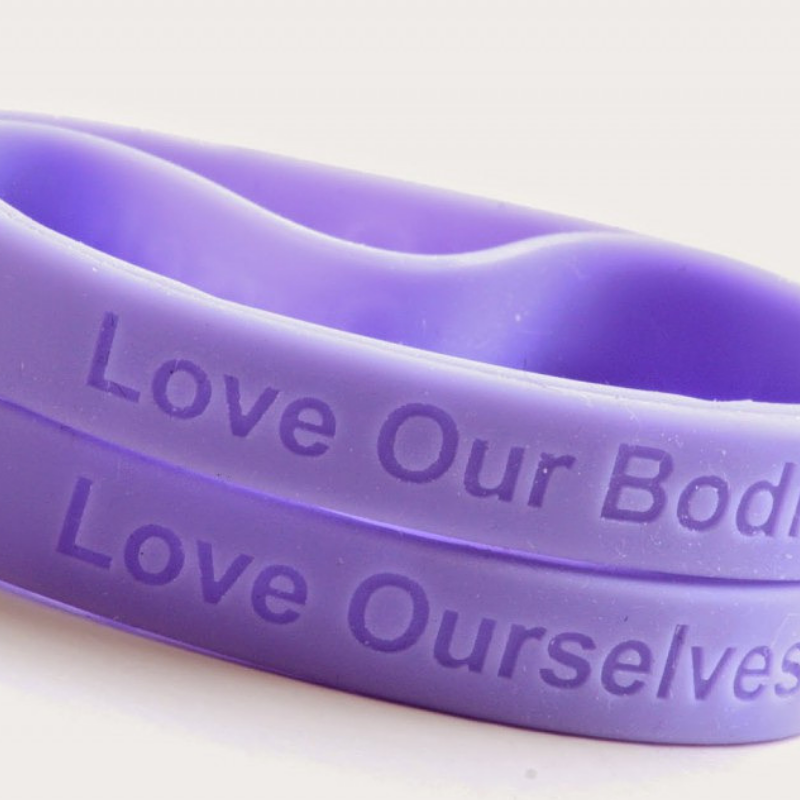 If you live in BC, click here to order your free wristband. Community partners across BC are showing their support for PEDAW. 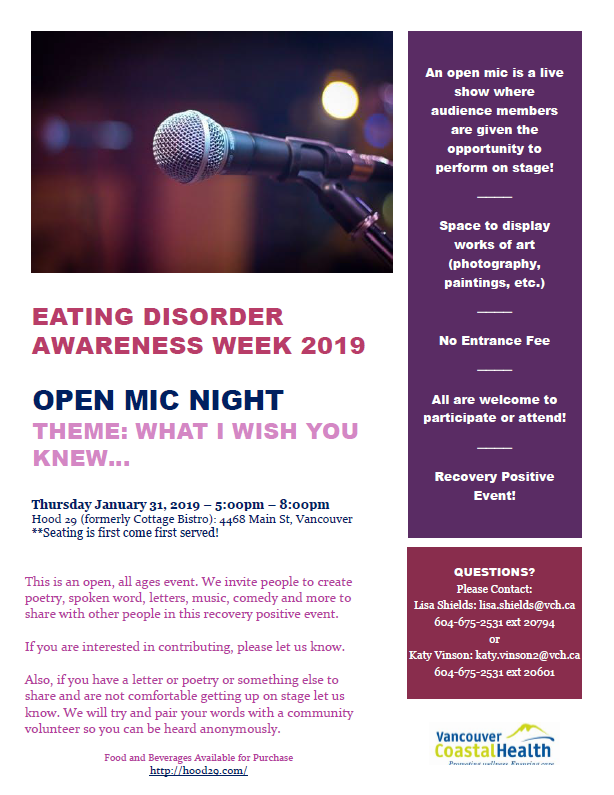 On January 31st checkout Vancouver Coastal Health Eating Disorders Program’s 2nd annual Open Mic Night ! An evening for creativity, caring, and community. Jessie’s Legacy will be supporting the event with a resource table equipped with free information and wristbands. Log in on February 13th for a free one-hour talk about this year’s theme of social media and eating disorders. The Provincial Adult Tertiary Specialized Eating Disorders (PATSED) Program’s presents Dr. Jasmine Fardouly of Macquarie University in Sydney Australia. How to login: Details will be added here shortly, check back soon! 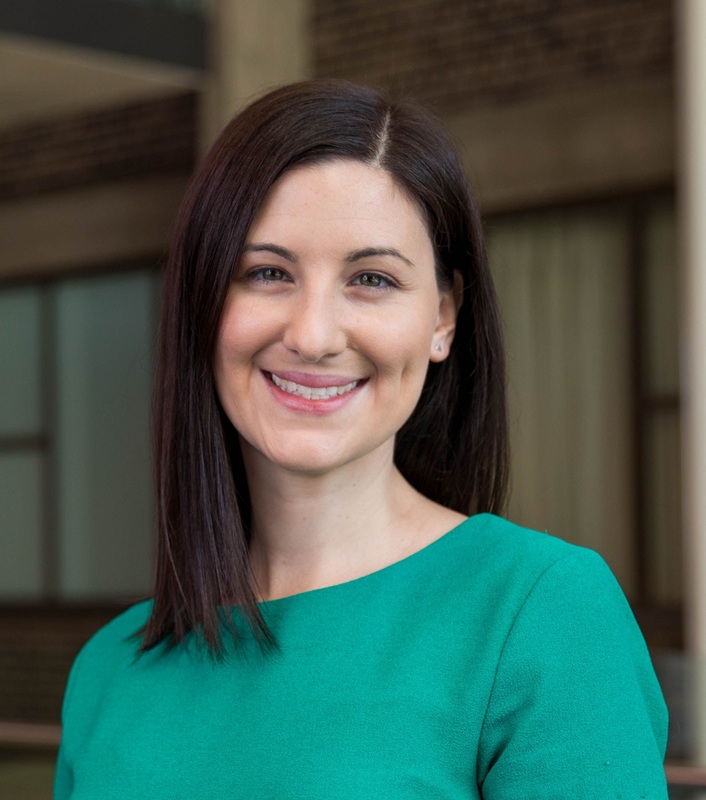 Read more about Dr. Jasime Fardouly and her work here. Let us know if you have any events you are planning during the year that can be added to this list!